There is a great Greek dessert that is called Greek Delight. It is actually more widely known as Turkish Delight, since it originated in Turkey. Some people still dispute that which is reasonable still after 400 years of culinary overlap recipes did exchange back and forth and many dishes lost origin. We can, however, give the credit to the Turkish for the development of this delightful dessert. Actually the Greek name of the dessert is loukoumi, very close to the turkish that is loukoum. Greeks though will keep calling it Greek Delight just because. The delightful dessert is a gel made with corn starch, sugar and a flavoring. It is then covered in a mixture of powder sugar and cornstarch to prevent the pieces from sticking to each other, and on your fingers. The flavors predominant in Turkey are rose and pistachio. In Greece it is mastiha and rose. Mastiha is a unique spice produced at the island of Chios. 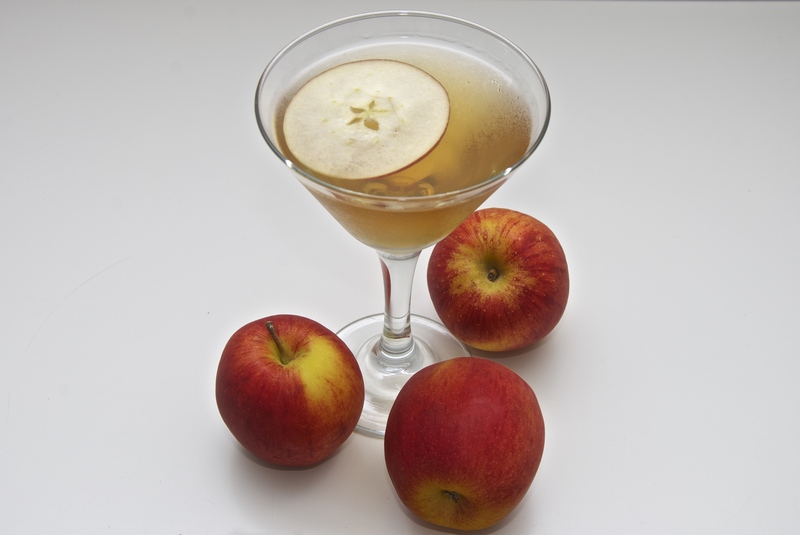 In the past I have made another cocktail flavored with Mastiha and even a cheesecake. Here I make a cocktail inspired by the flavors of the Greek Delight (Mastiha and Rose). 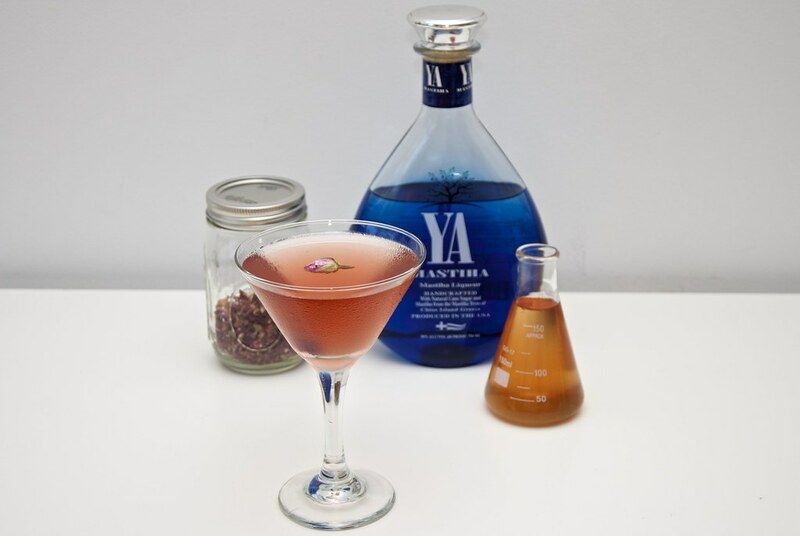 This cocktail merges the flavor of Masticha and Rose in one unique combination. Mastiha had in the past its own post. It is a considered a spice, but it is actually the resin of a pine tree. The trees not only are indigenous to the island of Chios, but also produce the unique resin that solidifies upon contact with air only at the north side of the island. There are now about 1600 trees on the island producing this resin in a painstaking process, drop by drop. The island has a portal that you can learn more about the product. There are not many places you can find the spice, it is however, listed at the store at the featured products. What is even more rare to find is the spirt flavored with mastiha. If you are lucky enough, maybe the local liquior store carries it. If you live in Manhattan, you are in luck because there is a store, brilliantly named mastiha shop, tha carries all things mastiha. I am very pleased to say that the unique flavor of this liqueur is now made in America by a passionate Greek-American. It is called Ya-Mastiha playfully resembling the Ya Mas sound that is used in Greece to toast. It is the abbreviation of “Stin Ygeia (iya) Mas” which means “to our health”. 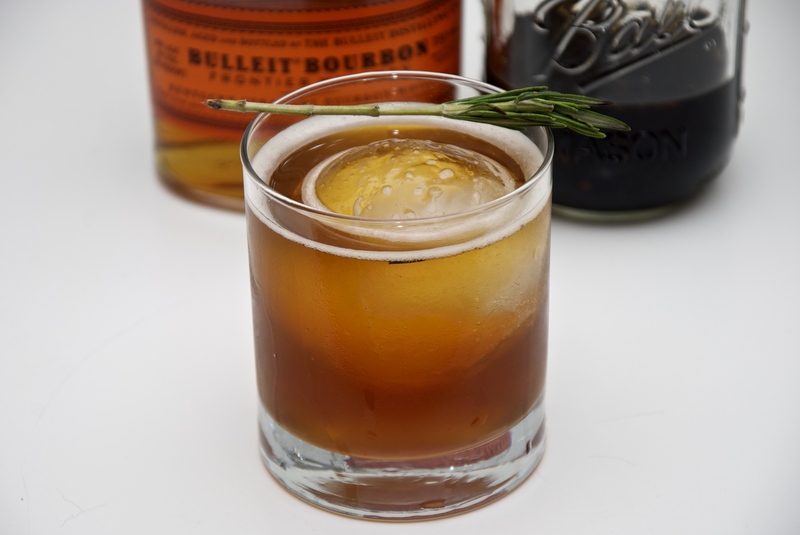 It is the labor of Nick Papnicolaou, a Greek-American who thought that it is only fair for the rest of the world to taste this elixir. He devoted three years to create a product that was representative of the greek culture, but was also appealing to the US market. 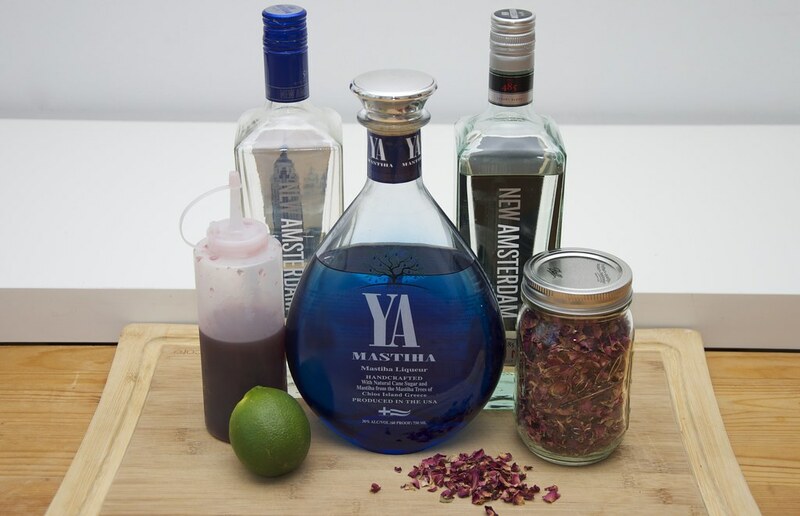 He worked with farmers in Chios in Greece to gather the purest and finest Mastiha available and teamed up with a NY craft producer from the Finger Lakes region to use the best local ingredients for the optimal formula. 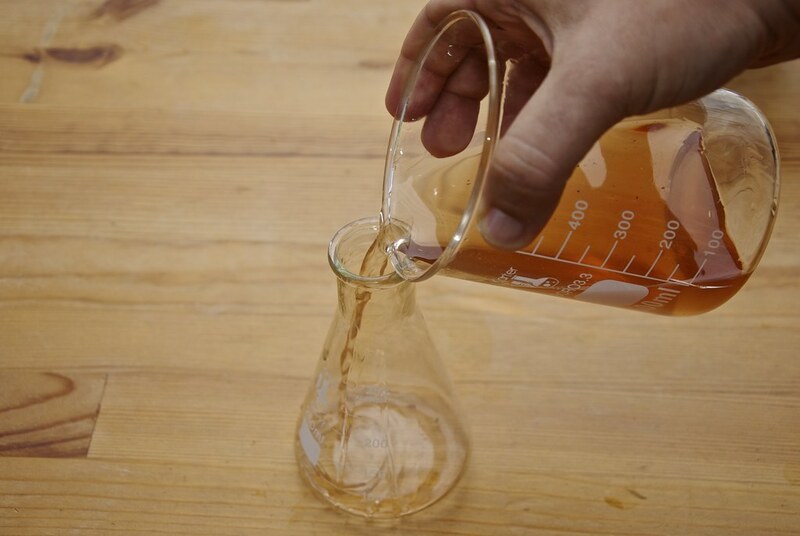 The signature tear-drop bottle mimics the tear drops of Mastiha as it comes out from the tree. The result: a natural, celebratory, sensorial, Greek drinking experience. 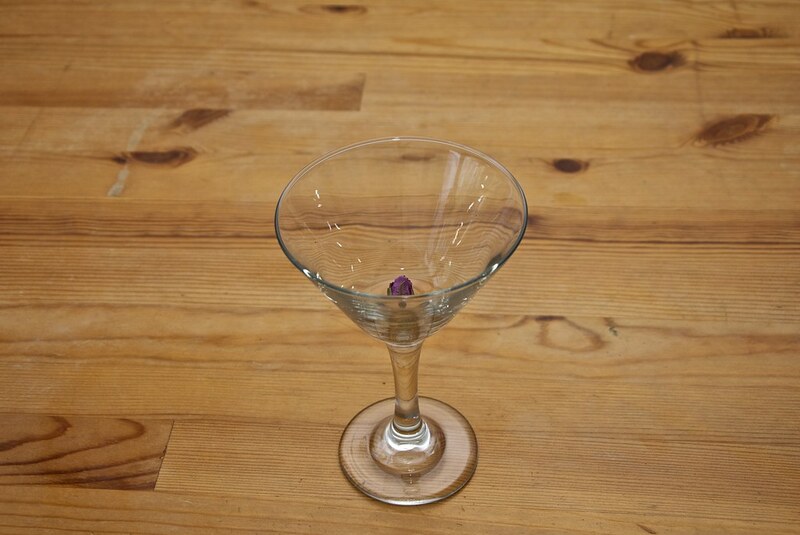 To complete the cocktail, in addition to this great liqueur we will need a rose flavored drink. 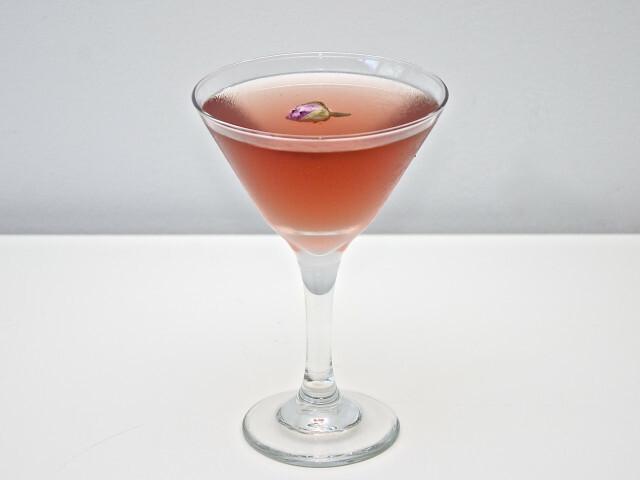 There are several rose flavored liquors in the market, from rose flavored vodka to rose liqueur. 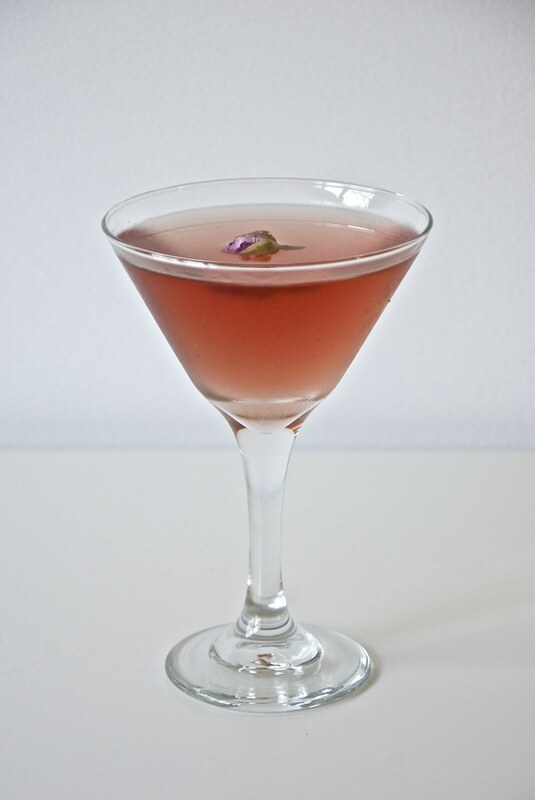 But, this is so easy to make that you should make it yourself, with rose petals and a pure spirit like vodka. This the reason actually I like vodka. It is an easily flavored spirit. 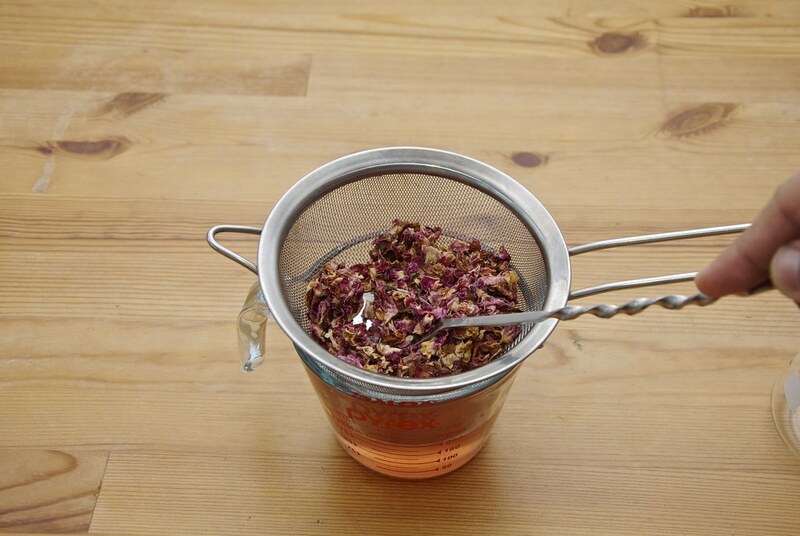 Here we will flavor it with dried rose petals, which is the fastest infusion you can ever do. So let’s get to it. 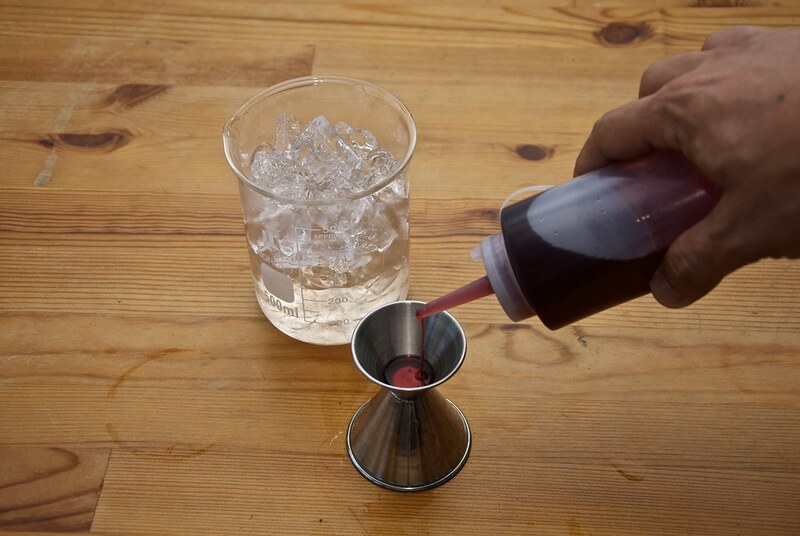 Start with your favorite measuring vessel. 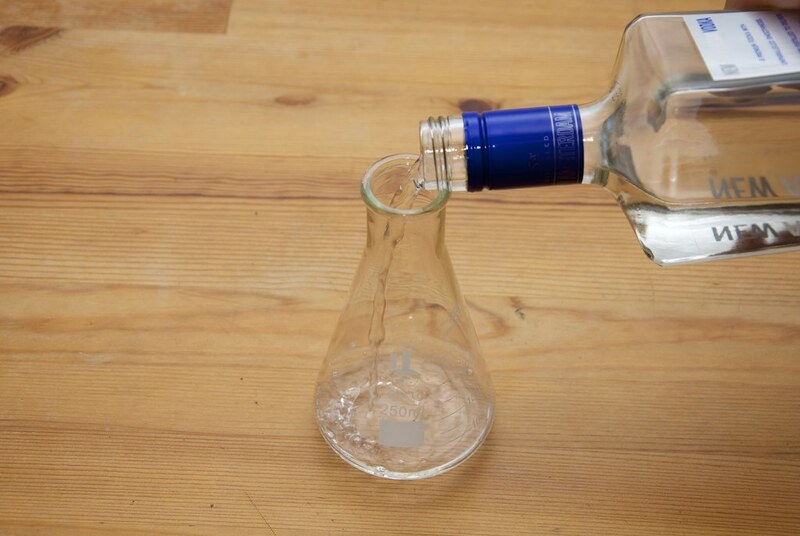 Where you will need to measure 250 ml of vodka. 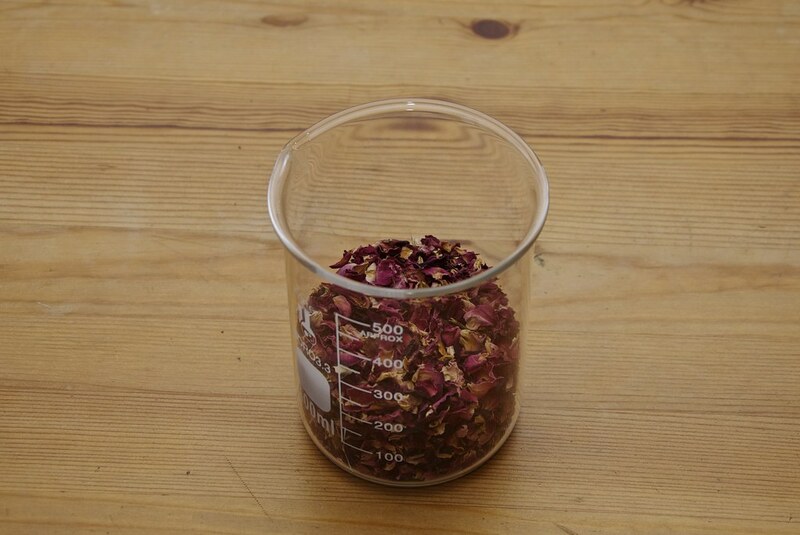 And measure about 1 cup of food grade rose petals. These are dried out and produced without any chemicals so they can be used with food. You can find them in spice stores and tea stores. 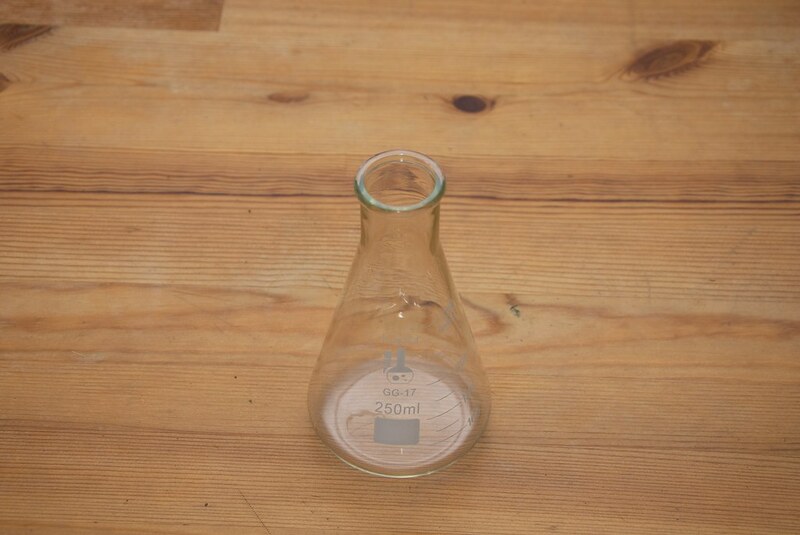 Do you like my beaker and flask containers? You can buy your own from the my store. Just click on the Nerd Out section. 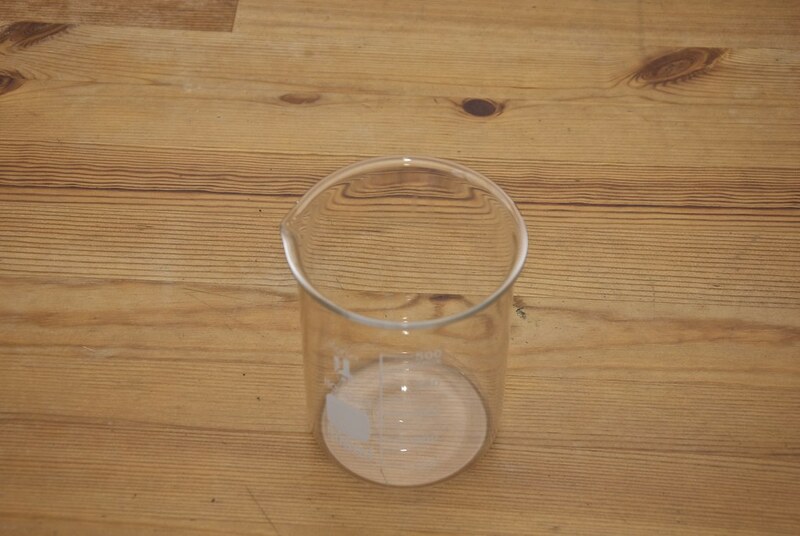 The cup is approximately at the 250 ml line. 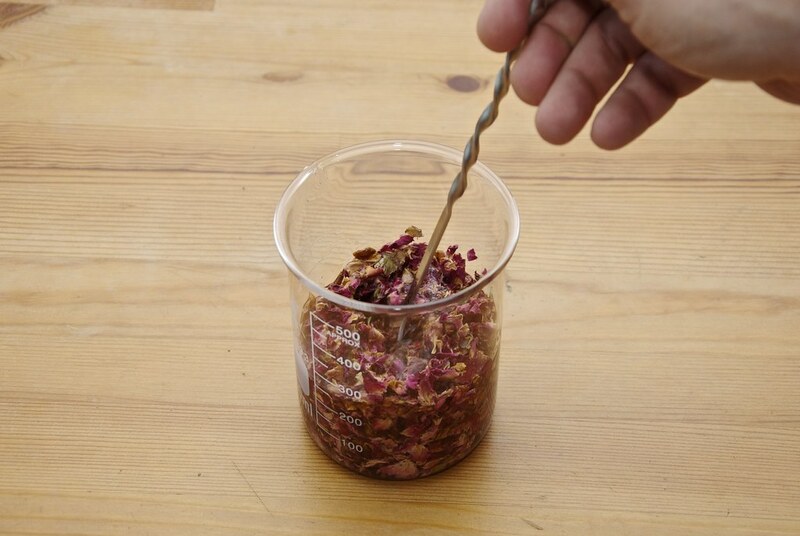 Add the vodka over the petals, while moving the flask around to wet all the petals. 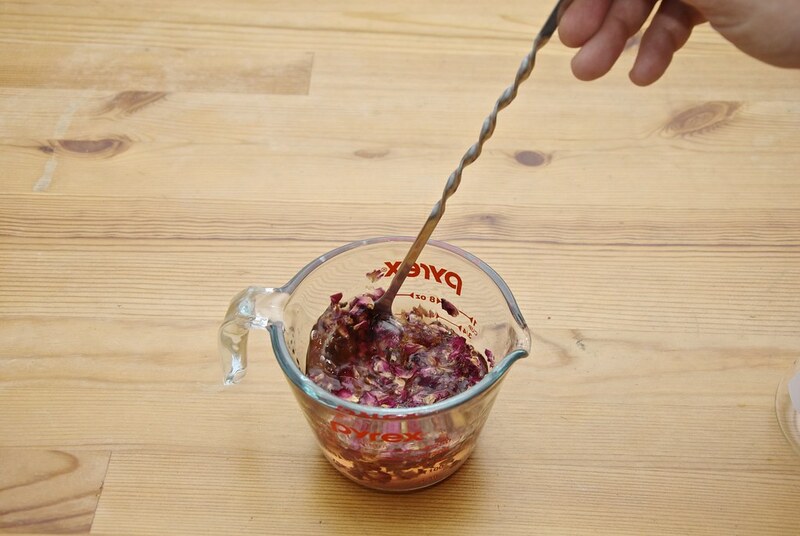 Use a spoon to mix gently the rose petals. Do that for about 2 mins. If you go longer the petals will start giving out grassy flavor and bitter taste. Whatever you do, don’t go for more than 3 mins. 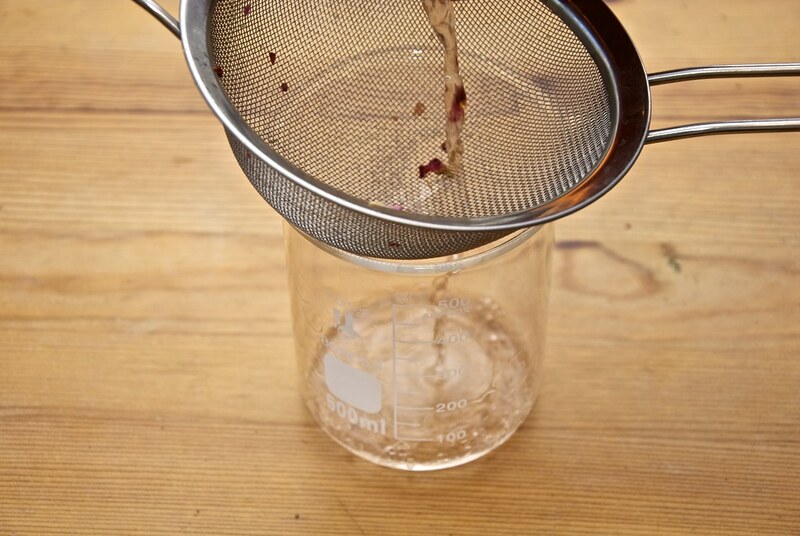 Strain the mixture through a fine mesh. 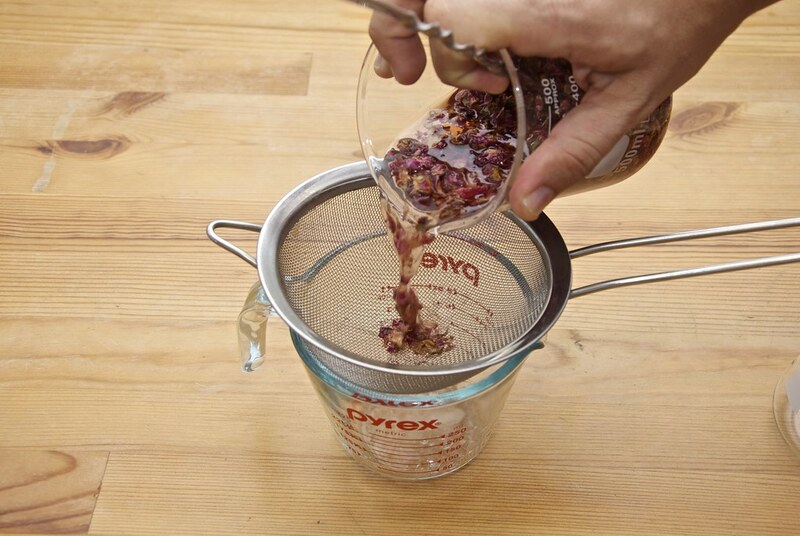 If there is dust in the rose petals you will need to use a fine filter like a coffee filter and pass it though that. The dust is just finely broken segments of the rose petals. That dust, will keep giving out flavors and especially those flavors that we don’t want, the bitterness and the grassy notes. Not to mention will make a cloudy spirit. 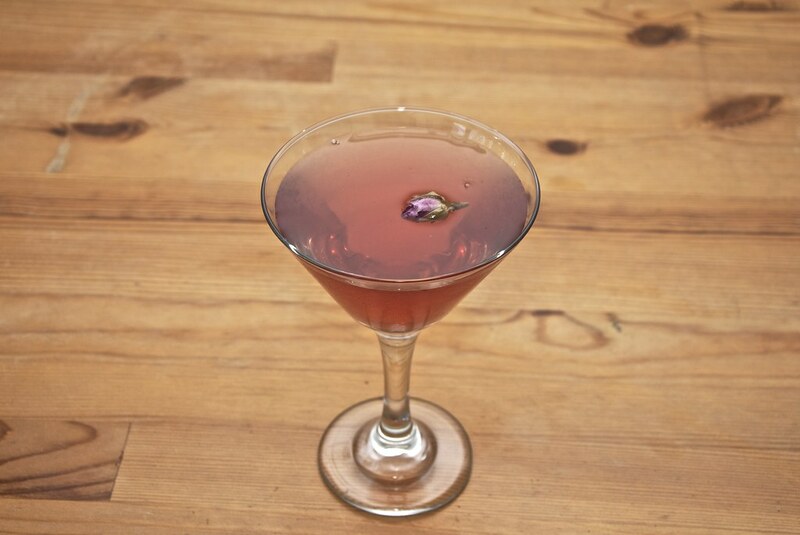 At this point you can mix the rose vodka with equal amount of simple syrup and you will get your own rose liqueur. add more petals and repeat the process. 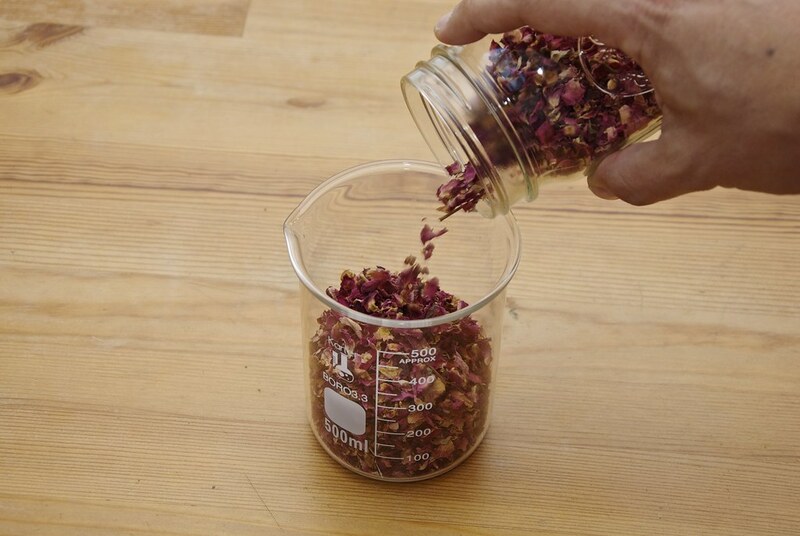 You can transfer the flavored rose vodka to a lidded container that you can store it in. Now we have a little less than what we started with. This is normal. Much of what is missing is on the rose petals that you will never recover. 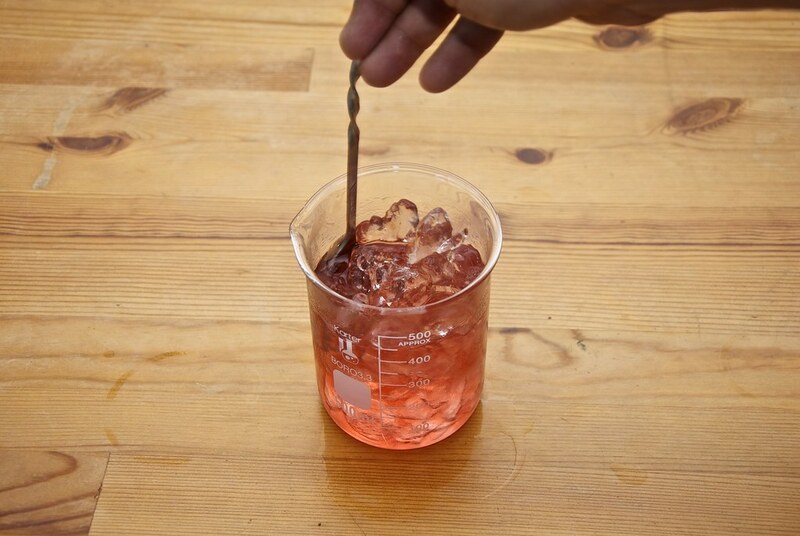 Measure 1 oz of the flavored vodka. 1 oz of the gin. 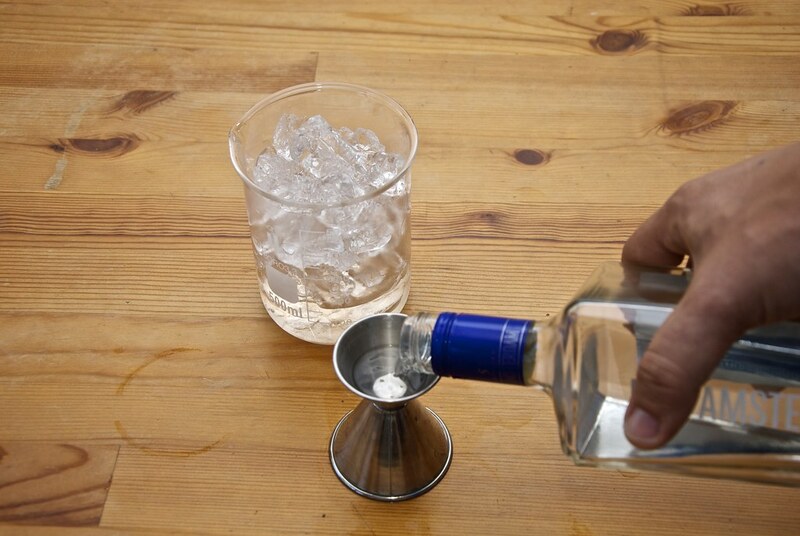 1 oz of the vodka. 1 oz of the Grenadine. If it is homemade it’s even better. 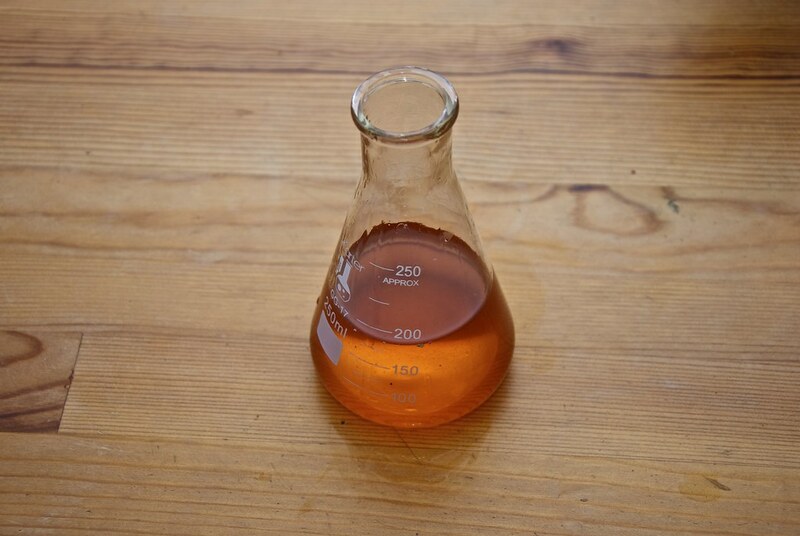 And finally measure 1 oz of the Mastiha liquor. Now stir the cocktail for a good 1 minute. 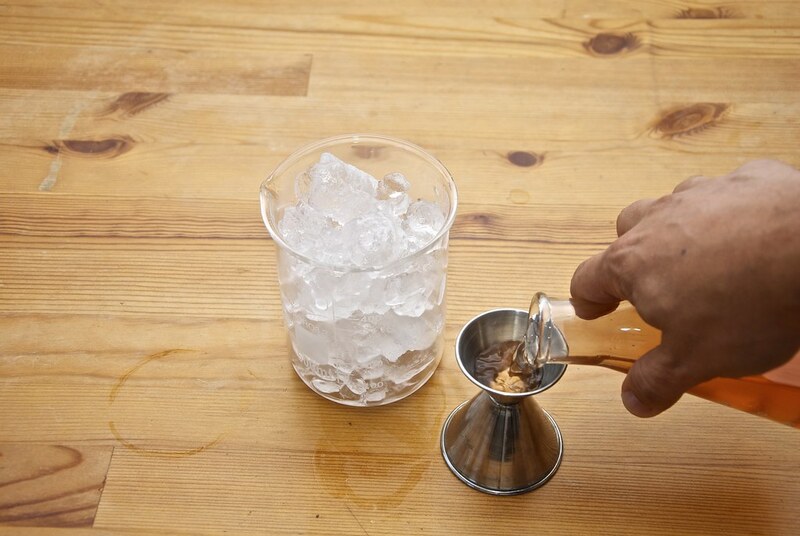 This will melt partially the ice and the water will help merge the ingredients together. At this point try it to see it it is too sweet. If you think it is too sweet add a couple of drops of lime. We need just enough to break the sweetness. You don’t want this to be lime-y. Just keep in mind that the lime is not always required. Here for example I think that the balance of the ingredients is perfect so I will add nothing. 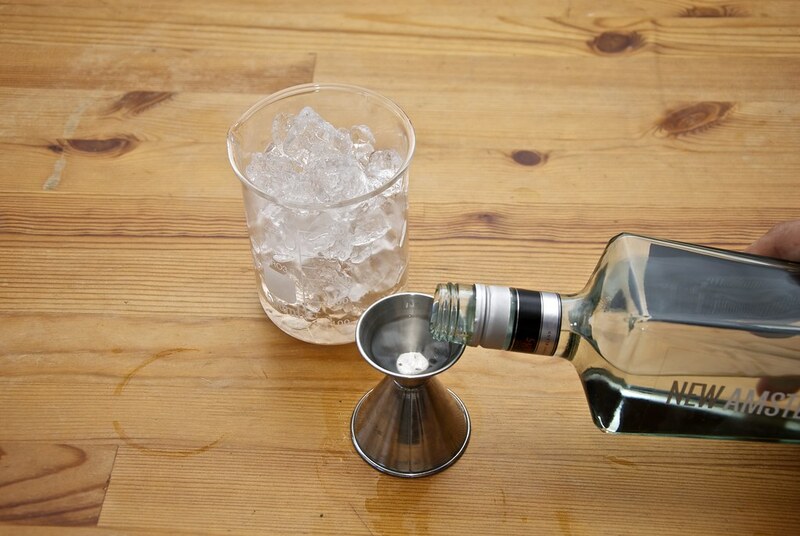 Take a chilled cocktail glass. Add a rose bud that will be used for decoration. This optional of course if you have it around. Althernative you can use some powder sugar on the rim to mimic the Greek Delight dessert. And watch the little rose floating on the top. 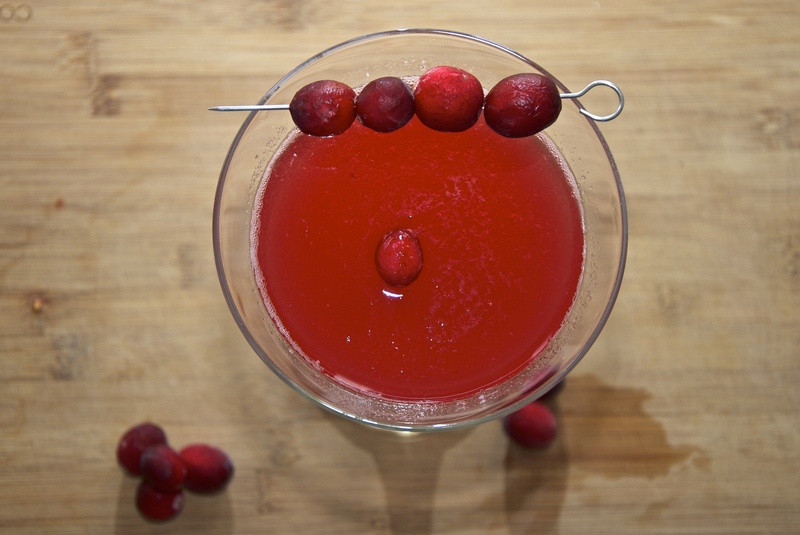 It is a great cocktail that mimics the unique flavor of the Greek delight. 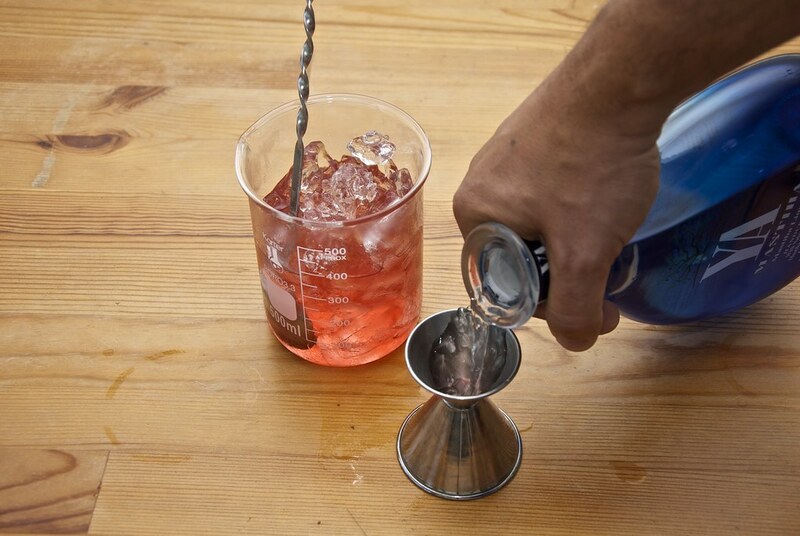 It does require some customization, but home mixology is all about that. 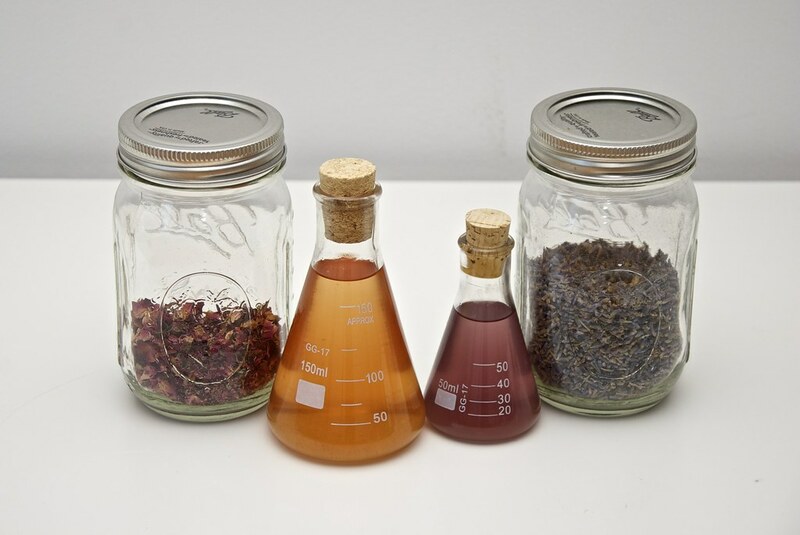 Making what you cannot find outside your home, in your home. Needless to say that you can do that with any dried flower. 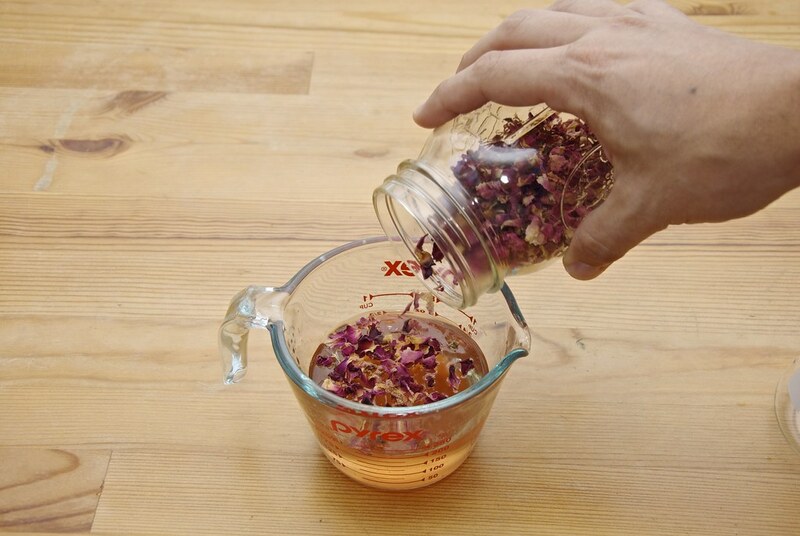 Here I made both rose and lavender. They can change the character of the cocktail in a snapshot. 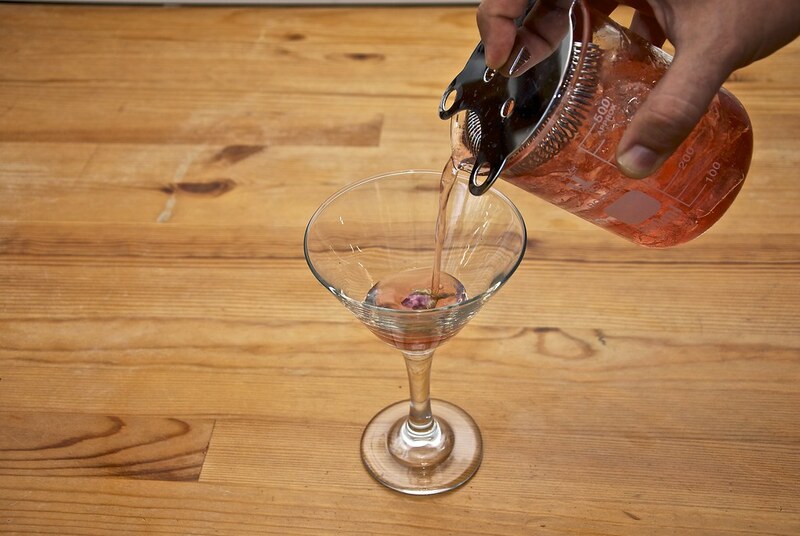 A great cocktail to mimic the unique flavor of the Greek Delight. 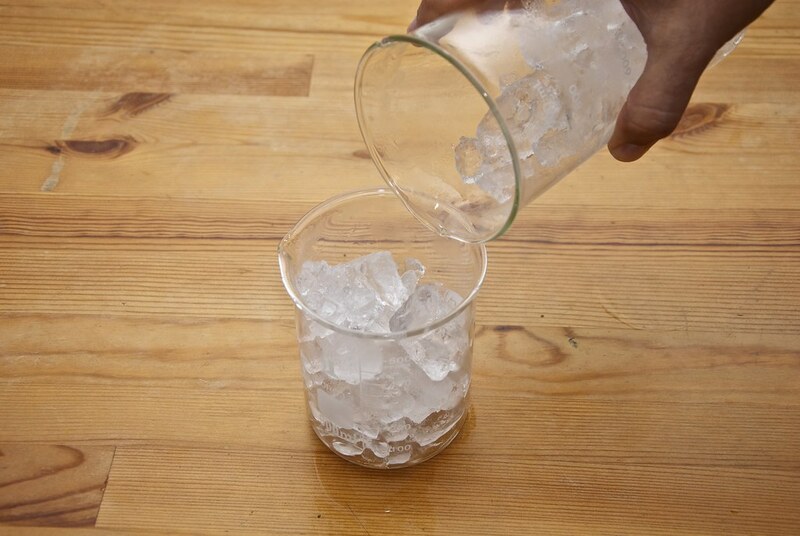 Put 2 cups of ice in a mixing glass. 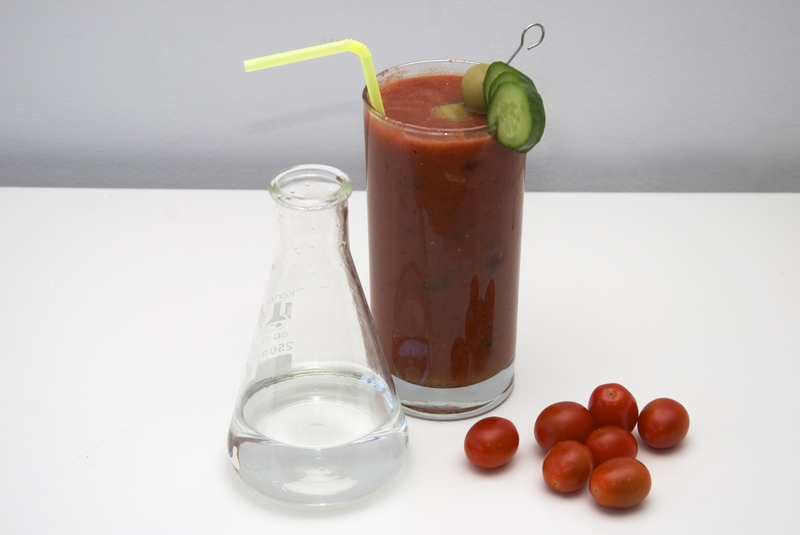 Mix the ingredients in a glass for 1 minute. 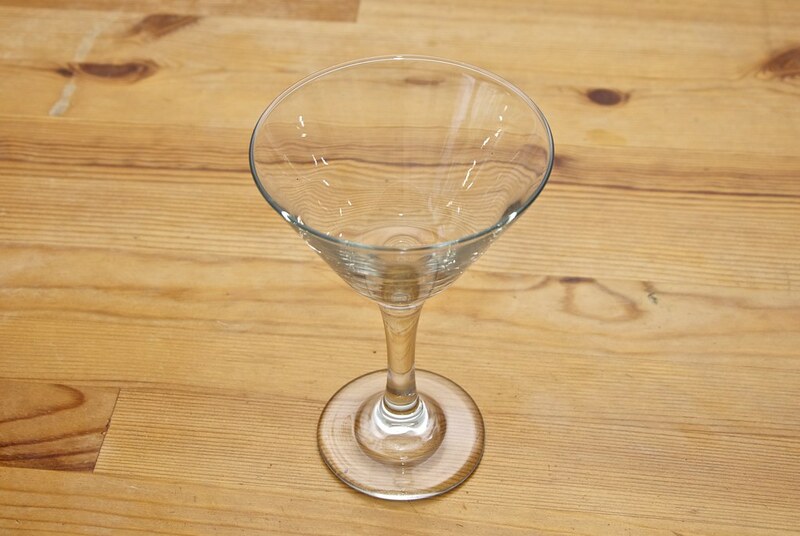 Poor in a chilled cocktail glass. 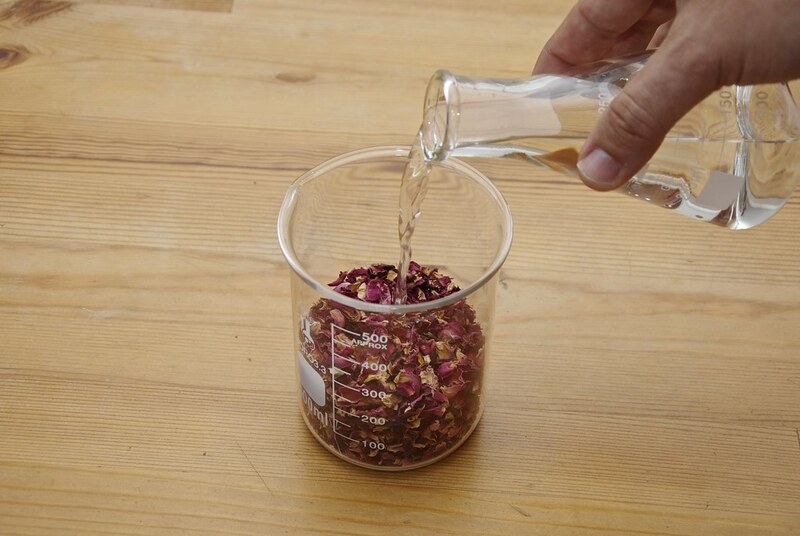 Make your own flavored vodka by steeping 1 cup of rose petals with 1 cup of vodka for 5 mins.